Total housing stats for 2014 topped the one million mark for the first time since 2007. Census and HUD reported December housing starts and revised estimates for October and November that pushed total construction to 1,005,800 for 2014. December levels were up 4.4% from November at 1,089,000. The late year push was led by single-family construction up 7.2% in December to an annual level of 728,000, the highest monthly rate since March 2008. Multifamily construction held virtually even at 361,000, down 0.8% from November. 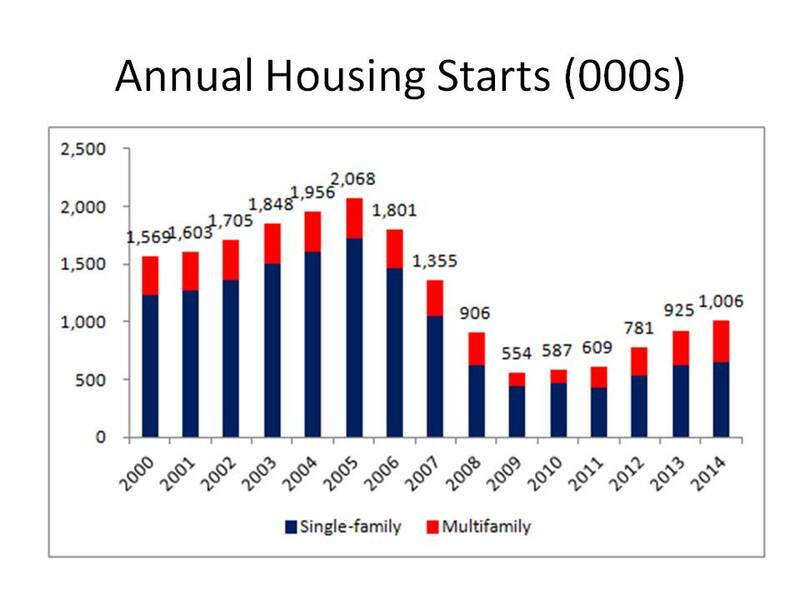 For the year, multifamily starts were up 16% to 358,000 and also the highest since 2007. Regionally, starts were up in three regions but down 13% in the Midwest from an unusually high November. Single-family starts were up in every region except the Northeast where they were down 7%. Total permits were down, led by a 12% fall in multifamily permits to an annual level of 365,000, which was still up 9% for the year. Single-family permits rose 4.5% in December and finish the year at 629,500, up 1.4% for the year. Single-family construction was weakened by the unusual weather at the beginning of 2014 and a rise in mortgage rates mid-year. The second half of 2014 saw the most improvement in single-family construction, rising from a monthly annualized rate of 606,000 to 640,000, a 5.6% increase. The increase bodes well for an expected continued improvement in the single-family market in 2015.